As full time house flippers and landlords, we’ve remodeled quite a few bathrooms. We’ve also lived in 7 houses over our 19 year marriage and have updated most of the bathrooms in each of those homes as well. 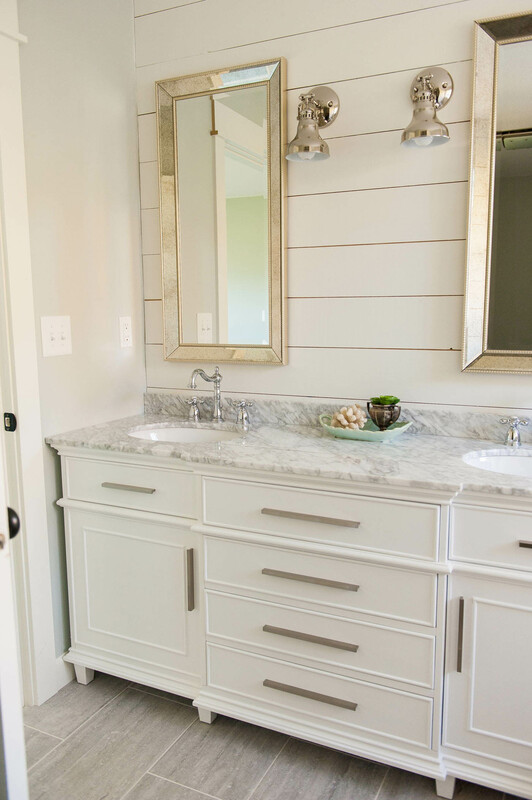 In some, we just updated the bathroom vanity with a new coat of paint and some hardware. 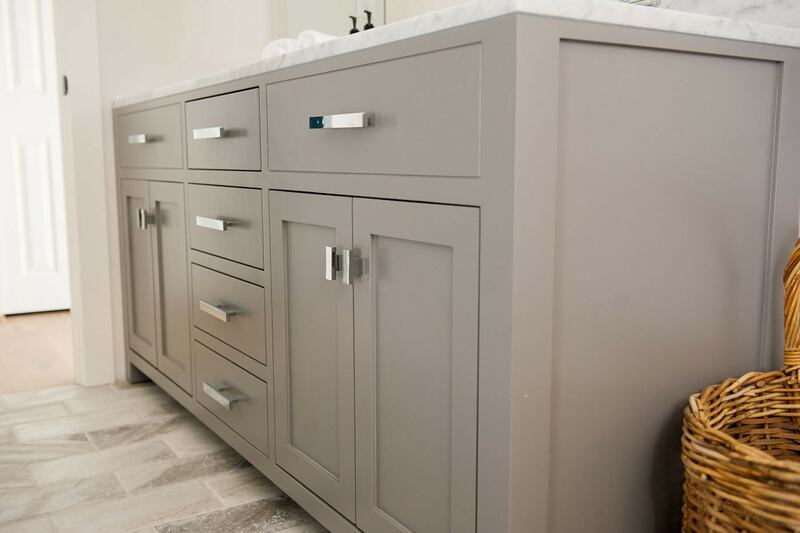 But in others, we did a full gut job – replacing the floors, vanity, plumbing fixtures and the whole enchilada. 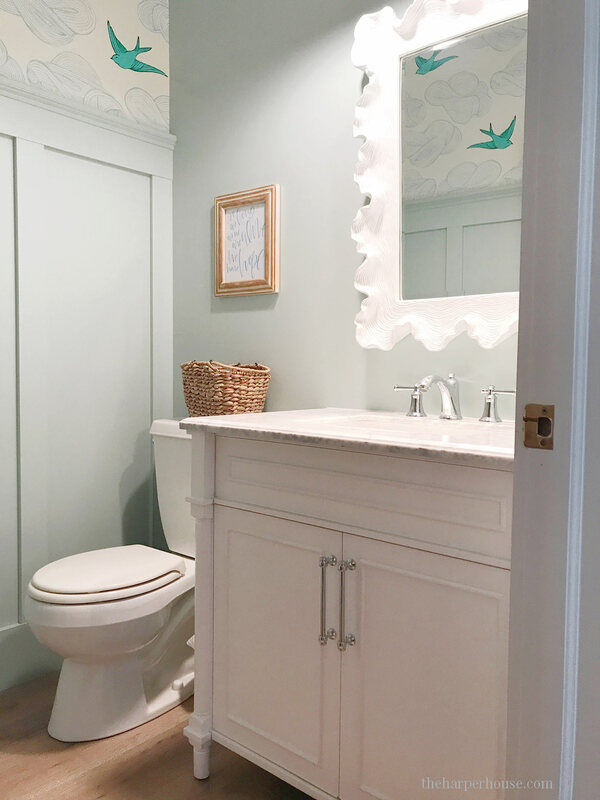 I haven’t shared a lot of those renos on the blog yet, but here’s a couple you could take a peek at: Classic Gray & White Bathroom ,Flip House Master Bath. 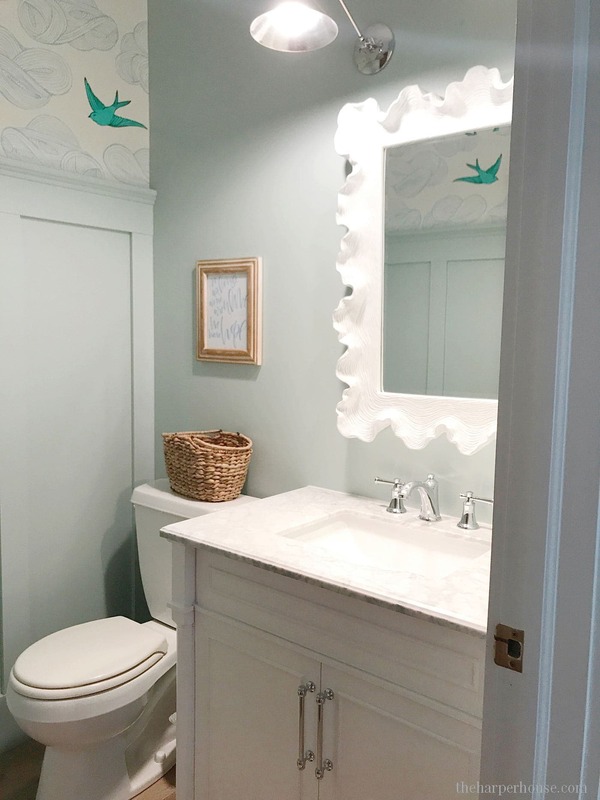 We recently completed our powder bath renovation, but still have 3 more bathrooms in this house that need attention (one thing at a time, right?). Since we are so frugal, we just can’t stomach the huge costs for custom vanities. Thankfully, I’m also a research nut and was able to track down some pretty sweet looking bathroom vanities. 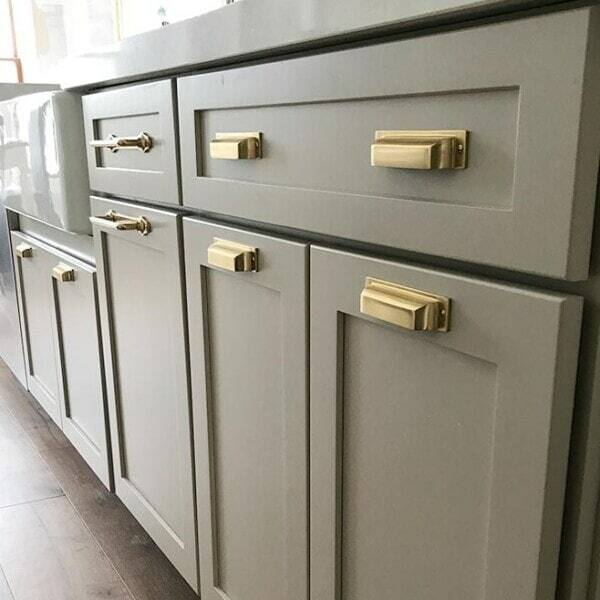 I put together a few roundups of the best ready made vanities – meaning you can get many of these shipped to you within a week. No waiting months for them to be built, and the price points are much more wallet friendly too. It’s a win-win! 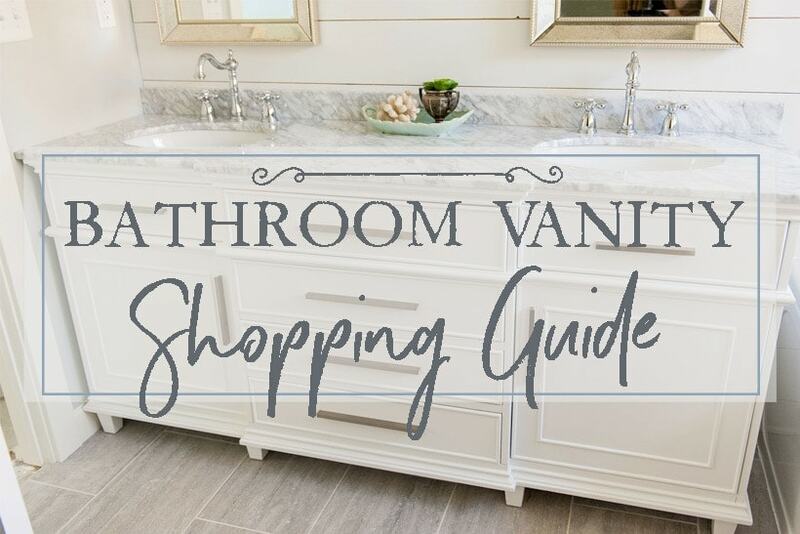 Also, keep in mind that these bathroom vanities already come with tops & sinks – so you’re saving even more money because you won’t need to buy an expensive countertop! woo hoo! 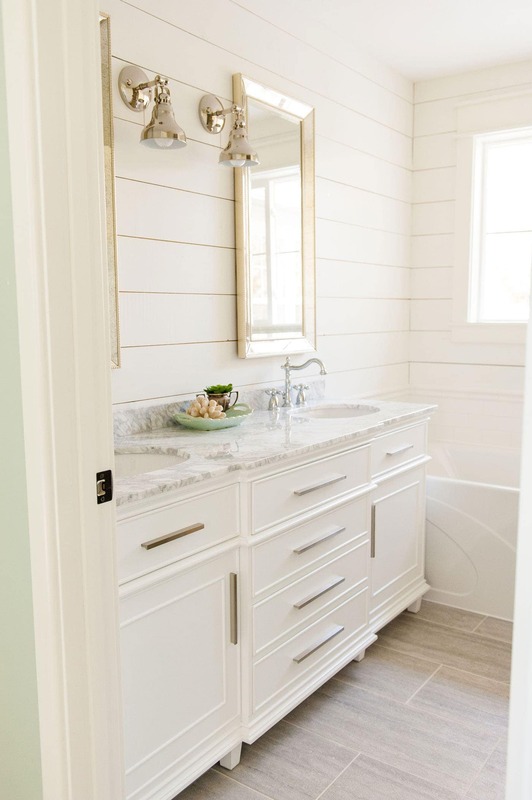 Be sure to scroll all the way down to see real life pictures of 3 of these vanities that we used recently in our flip house and powder bath remodel. **this post contains affiliate links. please see our full disclosure here. And here’s some pics of the Berkeley Vanity (#1 on the list above). We used this in the master bathroom of Mouse House and it was such a show stopper! 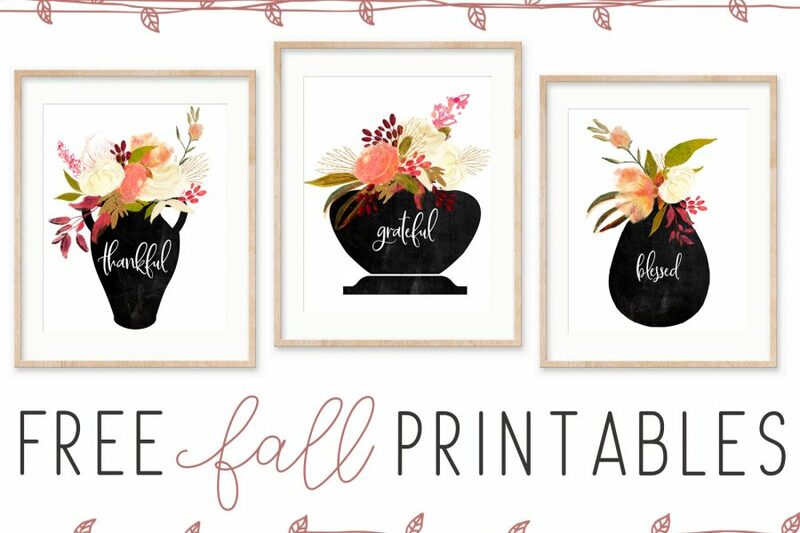 Everyone who saw it thought is was a custom piece – no one could believe we ordered it from Amazon! It offers tons of storage space and the marble is absolutely beautiful (especially the curved detailing.) I was originally planning to replace the hardware with something else, but I actually liked it in person so we kept it! 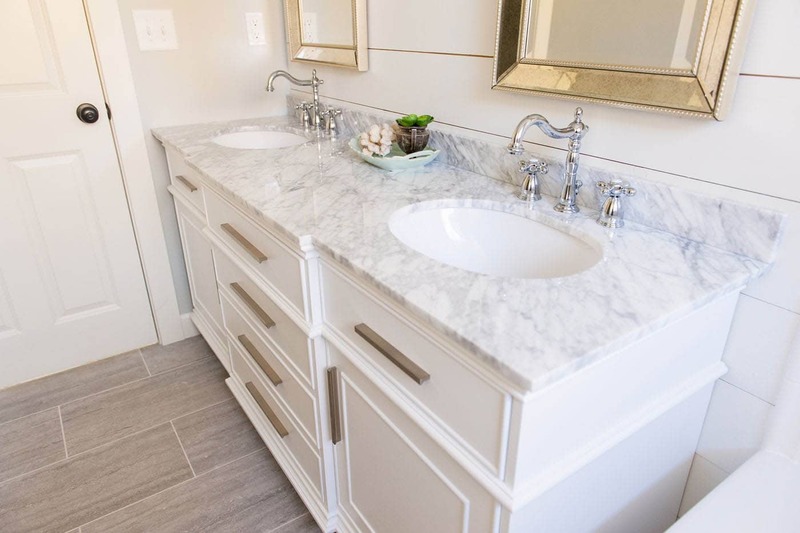 Another bonus to this vanity is the top marble/sink piece is not attached to the base, which makes it much easier to install (and much lighter to maneuver!) Craig was happy about that! We also used #5 on the list above for the hall bathroom in Mouse House. 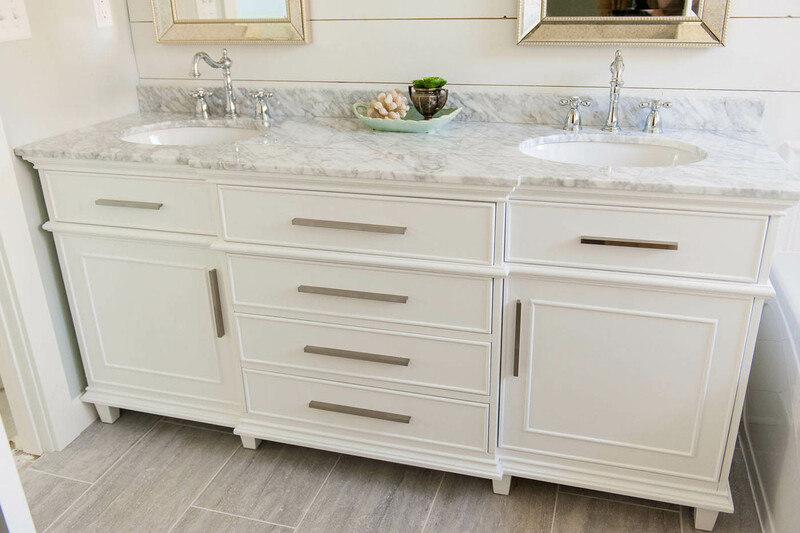 It’s a very nicely made vanity as well and definitely a great choice if you’d like something other than white. Just be aware that this one did ship with the top attached so it is quite heavy, so you might need some additional help carrying it into place. I was also able to roundup some single sink vanity options. 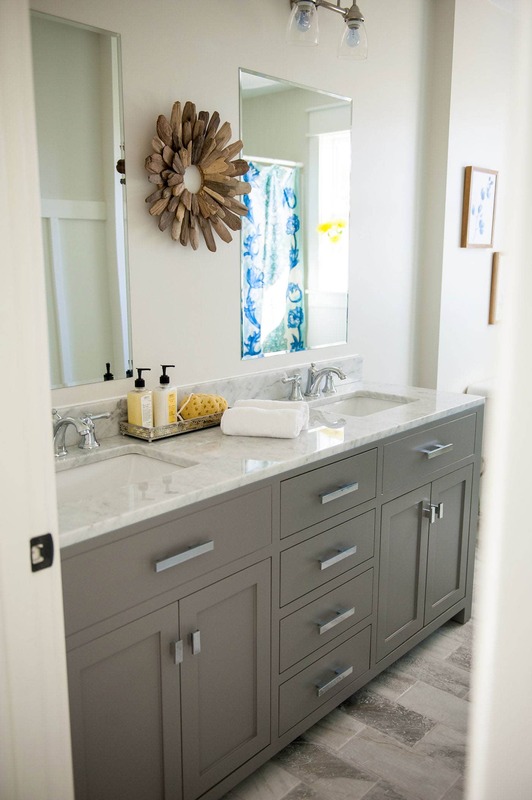 So many times, you are limited to choosing a specific size vanity. So I decided to break this next group down by sizes. 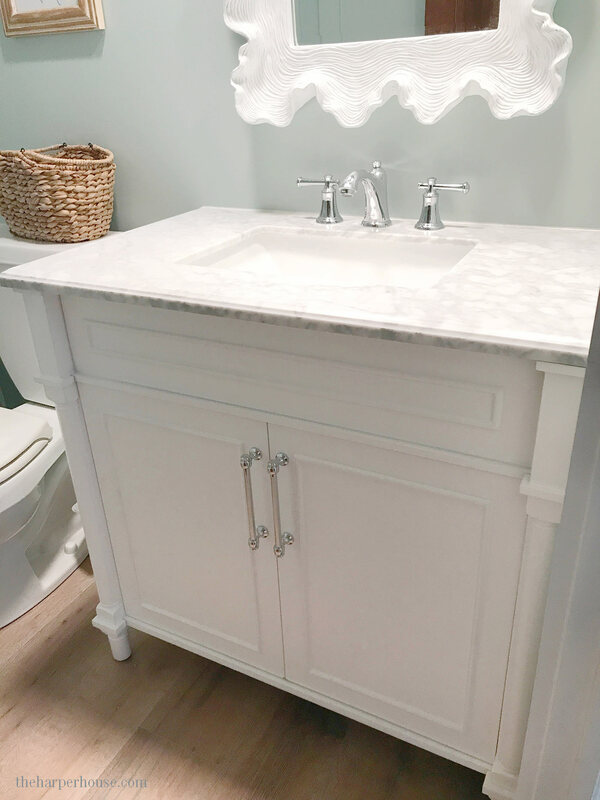 Renovating a bathroom can be super stressful but I hope this roundup of bathroom vanities gives you an idea of how you can still get a custom look for much less than custom prices! I’m always a little nervous buying such a large piece online, but I’ve had great experiences so far with the above vanities we’ve purchased. 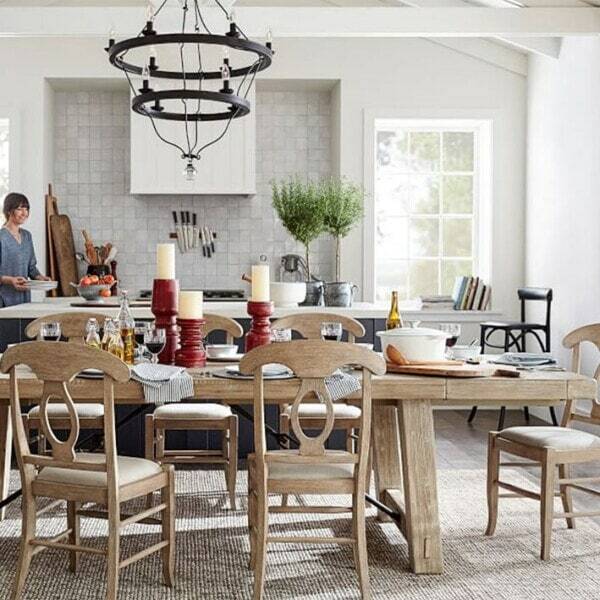 When shopping, just make sure to read all the reviews and take correct measurements prior to placing your order. Then take a deep breath, and go for it! 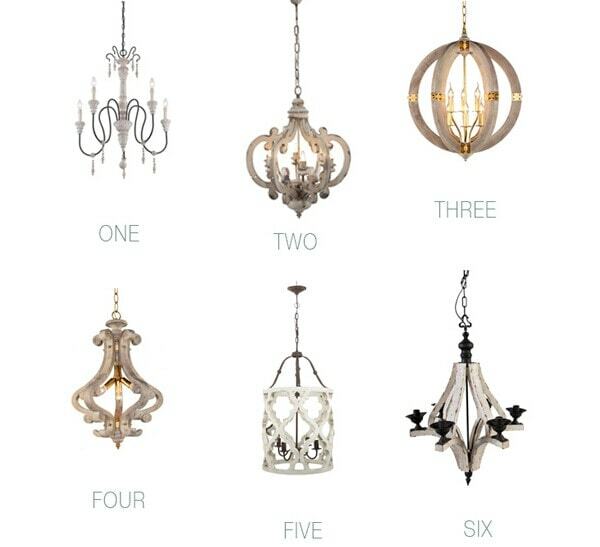 And with many of these choices, your new bathroom can be finished much quicker than you’d think! I’ll try to add a few more smaller sized vanities to this list soon, but I wanted to get it published quickly. 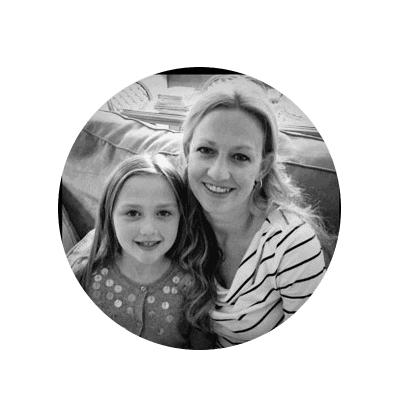 Let me know in the comments if you have any questions – I’m always happy to help! 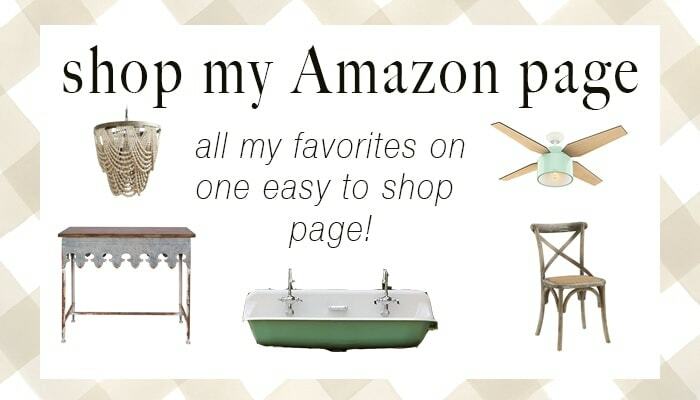 And be sure to follow my Pinterest boards Bathroom Vanity Ideas & Bath Ideas for lots more inspiration. Have a great week!